Daniel Has been surrounded by magic all of his life! At his 1st birthday party his parents hired a magician to perform for his family and friends. By the time he was 6 years old his father had taught him his first magic trick, and he was instantly HOOKED! He spent hours in the library and took home every book he could find on magic, and anything remotely related to it. Daniel would learn a trick, practice it for a few days, and then would demonstrate the magic over and over on his Father, Mother and his siblings. By 9 years old he started to gain some momentum as he began to perform more confidently for audiences outside of his family and he even participated in his first talent show. To everyone that knew him, Daniel was synonymous to magic, and magic to Daniel. The biggest thing about magic for him was the power to evoke the kind of reaction it gets. The ability to make someone feel that kind of joy and mystery is indescribable, and is part of what has fueled Daniel’s growth today. Ever since then Daniel has spent close to 20 years perfecting his craft and his Passion. Today he has performed for crowds as large as the hundreds, to small intimate groups of 3-5 at a time. He has worked with The New York Mets, Apple, the Aria Nightclub in Las Vegas and much more. 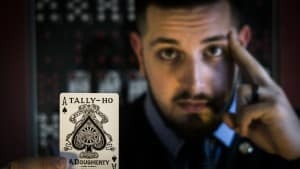 He has created his own magic, and helped other magicians by consulting with them. Daniel’s love for the art of magic is truly reflected in everything he does. Copyright 2017 DanielNicholasMagic.com - Serving Nassau County, NY, Suffolk County, NY, Manhattan, NY.